- Higher resolution display (300 ppi) - with twice as many pixels - Built-in adjustable light - read day and night - No screen glare, even in bright sunlight, unlike tablets - A single battery charge lasts weeks, not hours - Massive selection, low prices - over a million titles $2.99 or less - Prime members read free with unlimited access to over a thousand titles [Highest resolution e-reader display] With twice as many pixels as the previous generation, Kindle Paperwhite has an improved high-resolution 300 ppi display for crisp, laser quality text. [No glare in bright sunlight] Unlike reflective tablet and smartphone screens, Kindle Paperwhite reads like paper. [Read comfortably with one hand] Lighter than a paperback, comfortably hold Kindle Paperwhite in one hand for those times when you can't put the book down. [Charge monthly, not daily] Kindle Paperwhite won't leave you tethered to an outlet. A single charge can last up to six weeks (based on a half hour of reading per day with wireless turned off and the light setting at ten). 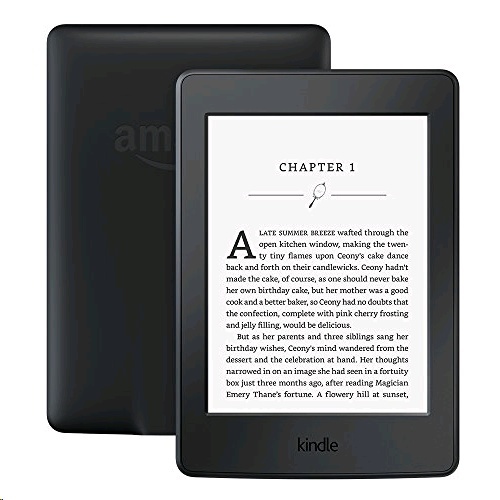 [Won't tire your eyes in the dark] Kindle Paperwhite guides light toward the surface of the display with its built-in front light�unlike back-lit tablets that shine in your eyes�so you can read comfortably for hours without eyestrain. Adjust your screen's brightness for great reading in any light. [Next-generation reading experience] Kindle Paperwhite offers Bookerly, an exclusive font crafted from the ground up for reading on digital screens. Warm and contemporary, Bookerly is inspired by the artistry of the best fonts in modern print books, but is hand-crafted for great readability at any font size. Typesetting engine lays out words just as the author intended for beautiful rendering of pages. With improved character spacing and the addition of hyphenation, justification, kerning, ligatures, and drop cap support, our best-in-class typography helps you read faster with less eyestrain. Enjoy reading with larger font sizes without compromising your reading experience. Page layout and margins automatically adapt to work well at even the largest font sizes. The typography and layout improvements are available on over half a million books, including many best sellers, with thousands more being added every week. [Lose yourself in a book] By design, Kindle Paperwhite is purpose-built for reading and creates a sanctuary so you can lose yourself in a book. Unlike tablets and phones, Kindle doesn't distract you with social media, emails, and text messages.